The Mistletoe Martini blends the flavors of cranberry and elderflower. Because it uses a light fruit juice instead of all heavy liqueurs, the flavor is refreshing and stimulating. So many Christmas drinks are super-sweet, creamy and heavy. Like Eggnog, which most people either love or hate, but which everybody definitely wants a break from it once a while. This drink comes as a welcome refreshing alternative holiday cocktail. It features cranberry juice and elderflower liqueur along with vodka to give it a nice kick. 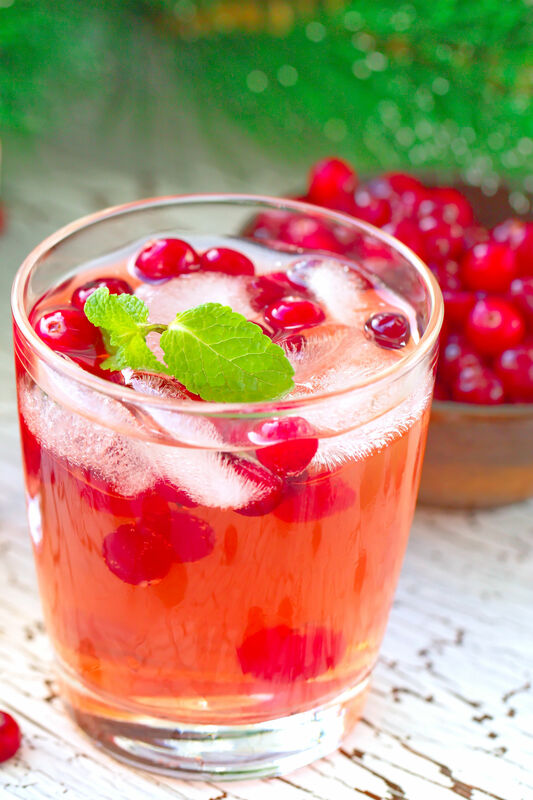 The result is a light, refreshing cranberry drink with just enough simple syrup to balance the tartness from the cranberries. The elderflower liqueur adds something magical to the flavor. There are several cocktail recipes that use the name Mistletoe Martini, and they’re all pretty different. They’re usually pink or red and most of them involve some type of berry ingredient, but there the resemblance ends. This is my personal variation on the Mistletoe Martini drink recipe. It’s all about keeping the flavors simple and refreshing while still keeping some sort of Christmas-y feel to the drink. What sets this one apart is the elderflower liqueur. I’m crazy about St. Germain’s elderflower liqueur and have a bad habit of working it into about 9 out of 10 cocktail recipes I create. But that’s because it’s got a flavor that’s really unique and hard to describe. St. Germain is laid back and a little bit flowery, but there’s also a brightness to it. like just a touch of lemon juice – not enough that you can identify it, just a hint. The cranberries as a garnish add a nice touch, too. They give the drink a little texture, something to bite on. And the way they just pop in your mouth is delightful. The overall flavor of the Mistletoe Martini is rich cranberry with hints of citrus. It’s a very simple and easygoing taste that most everyone will love. This is a delicious and beautiful vodka cocktail you can serve at holiday parties. You can make it up in big batches before a get together, and even let guests pour and top off drinks for themselves. And that means you get more time to visit with people, which is the point of a good party. Low maintenance cocktails are great because they help you to be more relaxed and attentive to your guests, which always makes a party more memorable. If you’re serving this drink at a get-together and you want some nibbles, it’s great with a really good Christmas Chex mix recipe. All those seasonings make a nice contrast with the sweetness of the drink. Another option is to make this beautiful cheeseboard. With these instructions, you can make a terrific, balanced cheeseboard that really works, no matter what cheeses, meats and side items you prefer. If you’re wanting to serve the Mistletoe Martini with a meal, it goes well with white meat. Specifically, a good juicy grilled chicken. Or grilled sea scallops, which are just amazing when done well. When grilling isn’t a good option, pan searing is another great way to bring out the best in white meats without drying them out. It’s easy to do at home, indoors, in any kind of weather. A note about sweetness in this drink: the recipe calls for a half ounce simple syrup. That’s supposed to be a conservative amount that’s just enough to help the elderflower liqueur counteract the tartness of the cranberry. 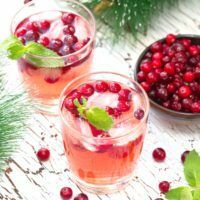 You can certainly use more, and you might need to do that, depending on what kind of cranberry juice you use. Some brands and some types of cranberry juice are sweeter than others. If you look at the ingredients labels on cranberry juice blends, you’ll see they range anywhere from about 8 grams to 32 grams of sugar. I use a cranberry blend. Lakewood is my preferred brand, but I’m also happy with Ocean Spray. Most brands are more than good enough for a cocktail. If you like this cocktail, you should also try the Cranberry Kiss, which blends cranberry juice with all flavors of a margarita. And then there’s the Crystal Cranberry, which features vodka, amaretto, Crown Royal, cranberry juice and more for an amazing drink. The Mistletoe Martini blends the flavor of cranberry with a touch of elderflower. It's a delicious vodka Christmas cocktail most everyone will love. Pour in the vodka, elderberry liqueur, cranberry juice and simple syrup. Garnish by tossing in a few cranberries and floating mint leaves on top. This recipe appears unfinished. 2 parts what? Mix which two vodkas? There is only one vodka listed. Please correct! Thanks. Whoops, I must’ve accidentally deleted something! Thanks for the heads-up – I’ve fixed it now, but you may have to refresh your browser to get it to show. It was “2 parts Punzone Limoncino”. Which is not available everywhere, so if you can’t find it, I recommend substituting white chardonnay with a squeeze of lemon juice and a little bit of simple syrup – Limoncino tastes like white wine sweetened with a bit of lemon. I’m confused don’t see the lemon part at all, but simple syrup is there. I see vodka, St. Germain, cranberry juice & simple syrup. I said the enderflower liqueur has a hint of citrus notes “Like just a touch of lemon juice”. That’s the only reference to lemon, so I’m not sure what you’re looking for. I have refreshed the page per your previous post. Can you verify if the recipe includes limoncino or white wine with a squeeze of lemon juice & rest of ingredients listed above or only the vodka, elderflower liqueur, cranberry juice, simple syrup, cranberries & mint leaves. The recipe looks really yummy & don’t want to leave out any ingredients. Thanks so much. The refreshed version is correct. I changed the recipe after it turned out one of the ingredients was only available in a couple of states. Can you tell me if the product is Elderberry Liqueur or Elderflower Liqueur? The recipe says Elderberry and in the blog part it saw Elderflower. It’s two totally different liqueurs. Thanks. Definitely Elderflower, and as mentioned in the post, I suggest St. Germain.